The tile sample is pressed under a specified load against a grinding path, strewn evenly with an abrasive power revolving at the rate of 30±1 revolutions per minute. The wear of the tile is measured using a thickness gauge.The abrasion testing machine consists of a replaceable grinding path fitted on a disc rotating about its vertical axis. 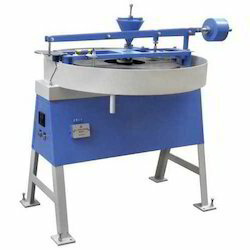 The rotating disc and the grinding path are enclosed by a circular tray. A bracket holds the specimen. The loading is by a counter balanced lever. A funnel is provided to facilitate charging the grinding path with a brass sive power.Supplied complete with automatic pre-set revolution counter and one 7.5 kg. weight but without abrasive power and thickness gauge. Suitable for operation on 415 volts, 50 cycles, 3 phase A.C.supply. With dial gauge 0.01 x 25 mm. Weights to weigh 50, 100, 150 and 200 kg. 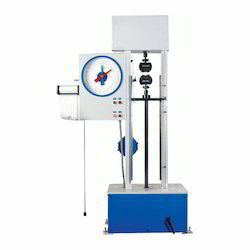 We offer a wide range of tensile testing machines which are designed for testing various materials like rubber, plastic, cable and various other products. This is used for determination of resistance to wear for Cement Concrete flooring tiles. Tiles specimen of size 7.06 cm x 7.06 cm is pressed face-wise under specific load on a grinding path and abrasive powder is evenly spread on the rotating grinding disc the second parallel side of the tile is subjected to wear for similar number of rotations. The wear of the tile is measured on a thickness gauge specifically made for the purpose. The machine consists of a disc rotating at a speed of 30 R.P.M. in a circular tray. A bracket is provided to hold the specimen. A counter balance lever loads the specimen. Load applied is 30 Kgf. A funnel is fitted to evenly spread abrasive powder on the grinding path. A Pre-set Counter automatically stops the machine after 22 revolutions. This counter is Re-adjustable. The machine works on 440 V A.C. Three Phase electrical supply. On request machine to operate on 230 V A.C.Supply can also be supplied. 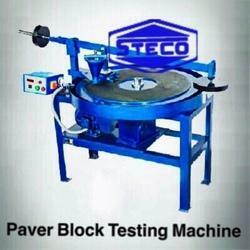 Looking for Tile Abrasion Testing Machines ?